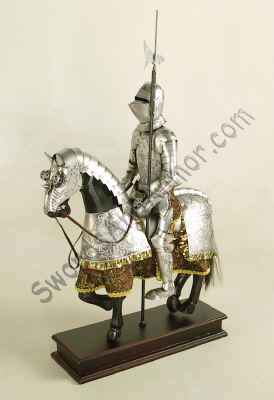 This 16th Century miniature mounted knight with silver finish armor comes complete with horse and armor with halberd pole arm weapon. Comes just as shown. Great item for desk tops, tables or book shelves. Great collectible item too. 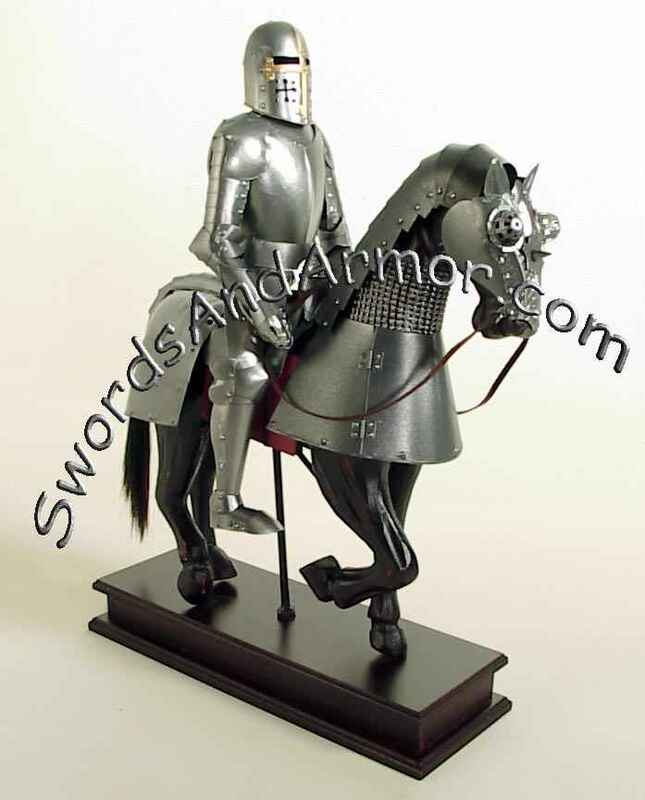 The Knight as well as he trusty steed are completely clad in authentic looking 16th Century plate armor. The piece Has wood-grain base and the horse is made of cast resin with metal armor and decorative cloth skirt. The knight is in metal with raised embossing. This stately 15th Century miniature mounted knight with horse in full armor looks great and is quite affordable. It comes as shown complete and ready to display. There is also a lance that you can position how ever you like with the medieval knight either in battle stance or at rest. The Horse is also clad in a complete suit of armor. We're not sure we have seen anything like it out there on the market at least nothing done this well for this price. It makes a fabulous gift item or and accessory piece for the desk, home or office. If they were not such a regal warriors, we would simply have to call them "Adorable"
is as easy as it can be . Returning customers can start a new order or place a duplicate order just like you did last time. Just place the items that you want into you cart, continue shopping, then checkout anytime you like. The entire process is secure to protect your information from hackers and thieves.